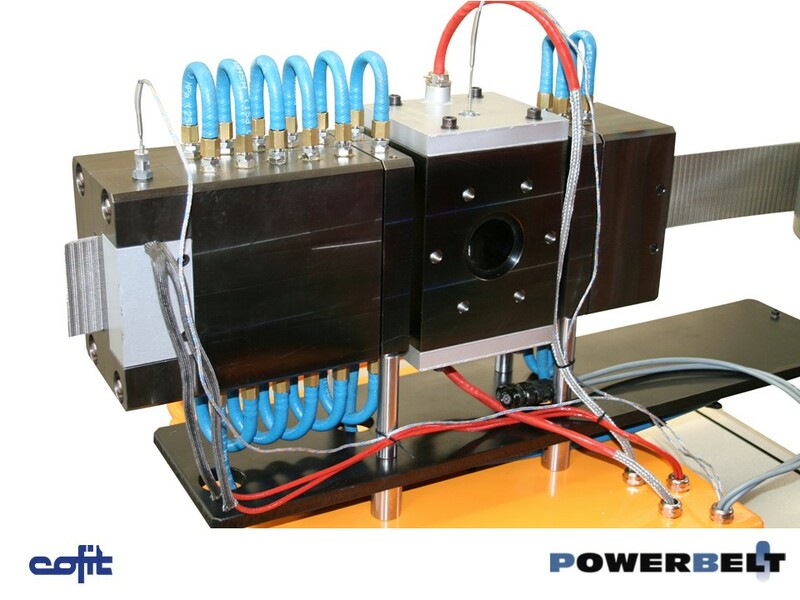 Powerbelt is an automatic and continuous screen changer. You can run up to medium-contaminated plastic without any process interruption. Once Powerbelt is started, the screen moves through it advancing in the melt flow towards the exit, retaining the filtered contaminants contained inside the molten polymer. During the extrusion process, the screen advances with no mechanical backing. Screen changing is produced by the switchover between cooling and heating of the molten polymer on a 4-steps cycle. Cooling – Cool water circulates in the entry and exit sections. The molten polymer, if cooled, solidifies and creates a pressure-tight seal capable of standing internal pressure, thus generating a barrier between the melt flow and the air – the polymer is kept in and the air out. Heating – When excessive contaminant accumulates, a screen advancement is required; the end part of the solidified plug is heated up and the melt seal is softened, ready to be moved onwards by the melt pressure. Screen Advance – The melt seal on the exit section is pushed toward the exit by the melt pressure. The advancing screen is slowly replaced by a new entering screen, which is obviously clean and free from contaminants. Screen Advance Interruption – Whenever the molten polymer is free from contaminants, the screen advance is no longer required and the heating elements on the exit side are switched off. The polymer solidifies, sealing the exit opening and interrupting the screen advance. 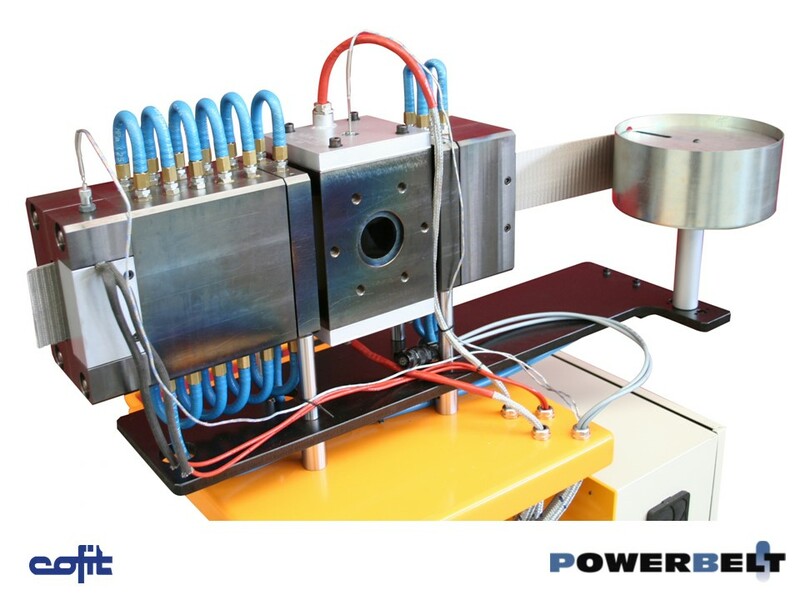 Powerbelt is a high-quality automatic and continuous screen changer for thermoplastics extrusion systems. It has no motor or moving mechanical parts, it guarantees continuous production, and virtually requires no operator assistance while running. Powerbelt is designed and built to prevent any possible leakage. The material itself provides perfect sealing. Improve the quality of your plastic production. At screen changing, pressure drop is irrelevant, with no air contact. Without moving or power-driven mechanical parts, Powerbelt requires no maintenance interventions, except for screen roll replacement. Thanks to its advanced control system, Powerbelt is fully automatic; while filtering, Powerbelt screen changer automatically operates screen advance, depending on the material contamination level. Time and pressure are settable parameters; dual or manual control modes are available. All basic process parameters can be monitored from the control panel. Powerbelt is most suitable for processing medium-contaminated materials, such as post-industrial waste. 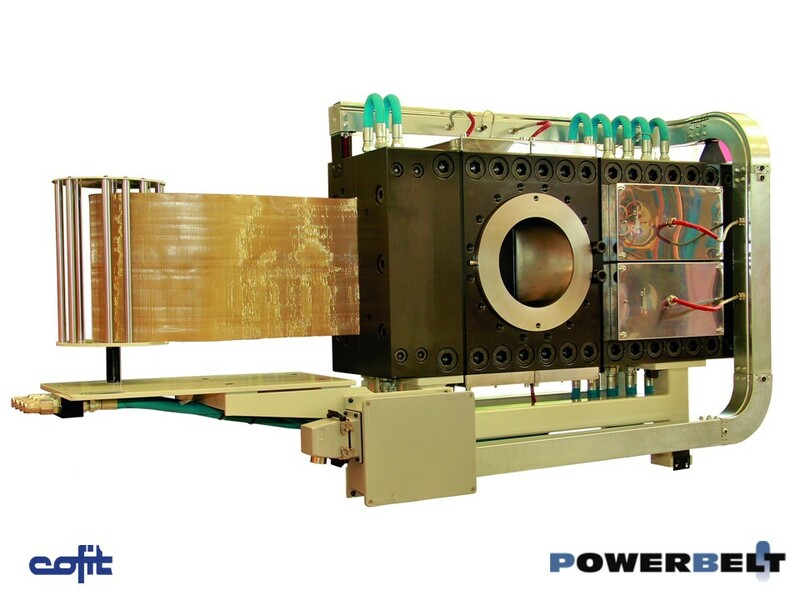 This new version of Powerbelt screen changer is an excellent solution for extrusion lines producing a wide range of products: blown and cast films, thermoformed foil, foamed sections, oriented bands, yarns, wires, pipes and many other products. Powerbelt is the right filtering choice for all products requiring both continuous extrusion and extremely stable process conditions. 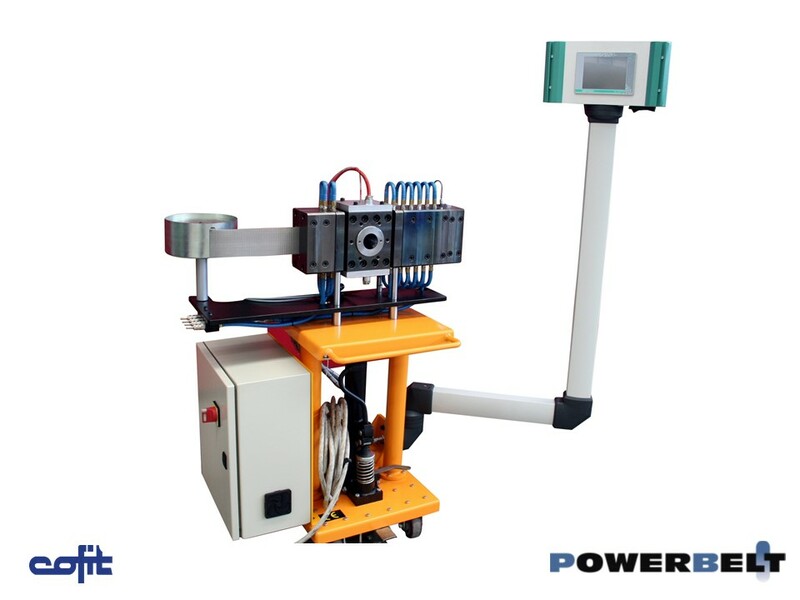 Powerbelt is designed to prevent pressure variations while running and at ordinary maintenance stages: during screen replacement, pressure drop is reduced to irrelevant values. Powerbelt has no motor, gears, hydraulically or pneumatically operated components, and no power-driven parts, except for the screen itself, thus being virtually indestructible. With no need for manual replacement of screen, it does not require any operator assistance. I understand that my personal data will be used for sending technical information and for further commercial contacts, according with EU 679/2016 . If you don't want to receive any further communication from Cofit, you can ask to be deleted in any moment by sending an "unsubscribe" email to info@cofit.com. We take care of your personnel training. When a Scrapeaway screen changer is set up and ready to start, your personnel is trained by Cofit specialists on machinery configuration and operation.